Heagney is a name synonymous with the thoroughbred racing and breeding industry, with Peter Heagney being the voice of Inglis and a wonderful supporter of the breeding industry throughout Victoria. However, it was his wife Helen who was back in the winner’s circle, with her beloved Off The Track Thoroughbred, Auteuil taking out the event for ex-racehorses under saddle at the recent Lancefield Show. The gleaming and typey hack, Auteuil, who raced as Gibralatar Melody was bred by Woodside Park Stud in Tylden is a ten-year-old gelding by Rock of Gibraltar out of the Piccolo mare Melody Bay, was luckily spotted by Helen’s sister when out inspecting yearlings. “I am looking forward to getting Gezza, (named after the former manager of Woodside Park Stud, Gerrard Jones) out to a few more shows over summer and just enjoy showing him in a relaxed environment,” citing her highly competitive days are behind her. A showing legend and dressage judge, Helen has a lifetime of competitive experience, having won four Garryowen Trophies, produced three FEI horses, and represented Australia in Pacific League competitions at Prix St. George level. Helen has had extensive experience in serving Equestrian Australia and is an A Level Dressage Judge and Judge Educator, having judged extensively throughout Australia. She is also a Young Horse Judge Educator and General Judge Educator, having served as Chair of the Dressage Judges’ Education Panel in Victoria for 14 years. 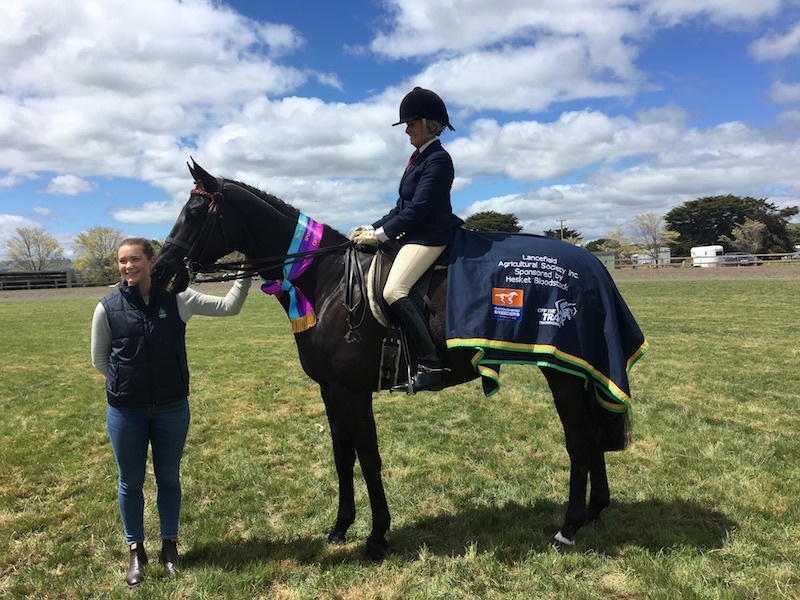 Helen is also instrumental in organising the National Final of the Off The Track series which will be held on Friday 30th November 2018 at Werribee Park National Equestrian Centre. With an experienced and diverse panel of judges it is sure to be a highly competitive and contested event. The judges include racehorse trainer Tony McEvoy’s wife, Jo McEvoy, UK Judge Jerome Harforth who has an extensive background in showing thoroughbreds in England and highly respected Equestrian Australia’s Team vet, Dr Dennis Goulding. While the OTT final is only open to qualified combinations, they will also be holding the incredibly popular Fashions on the Field event which will be open to all. An event where the fashions worn by the handler are equally as important as the turnout of the horse, this in-hand event is rapidly gaining popularity and is a real treat for spectators. Amongst the judges will be VRC Chairman Amanda Elliot, Racing Victoria ambassador Georgia Connelly and the Herald Sun’s Celebrity and Fashion writer Fiona Byrne. Indeed, a night not to be missed by both racing enthusiasts and equestrian lovers alike.